I didn't know quite what to think when it was announced late last year that Mélisse would be closing. 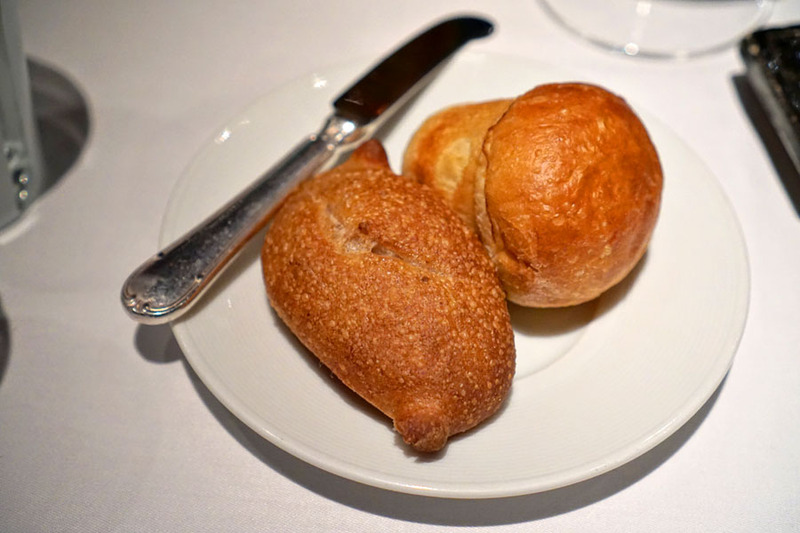 Opened in July 1999 by Josiah Citrin, the contemporary French spot was one of the few bastions of fine dining left in Los Angeles, and seemed to be doing quite well. 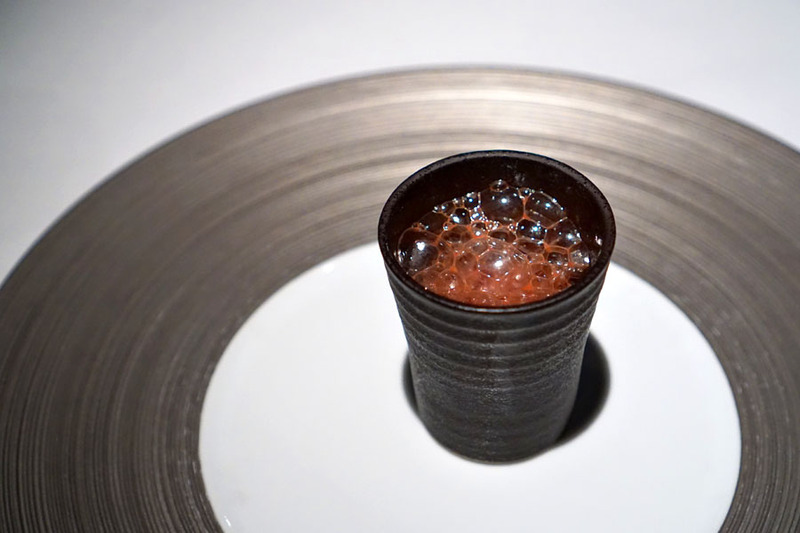 At the same time though, LA has been moving further and further away from traditional fine dining, so I understand if Citrin and his Chef de Cuisine Ken Takayama felt the need for a change. In any case, I made sure to pay the restaurant one more visit before its final night of service on March 2nd. One last look at the main dining room, which was last remodeled in 2009. 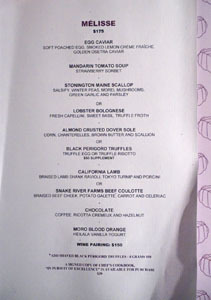 For Mélisse's ultimate week of service, there was but one menu option: a seven-course selection of "greatest hits" priced at $175, plus $150 for wine pairing. We ended up skipping the pairing and getting bottles instead. Corkage is $50, but is waived if you buy off their list. Click for a larger version. Our meal commenced with a palate cleansing amuse bouche: a blood orange-pomegranate soda infused with the restaurant's namesake mélisse. It was a fun little shot, with its refreshingly bright, sweet-tart flavors of citrus perked up by a mintiness from the lemon balm. 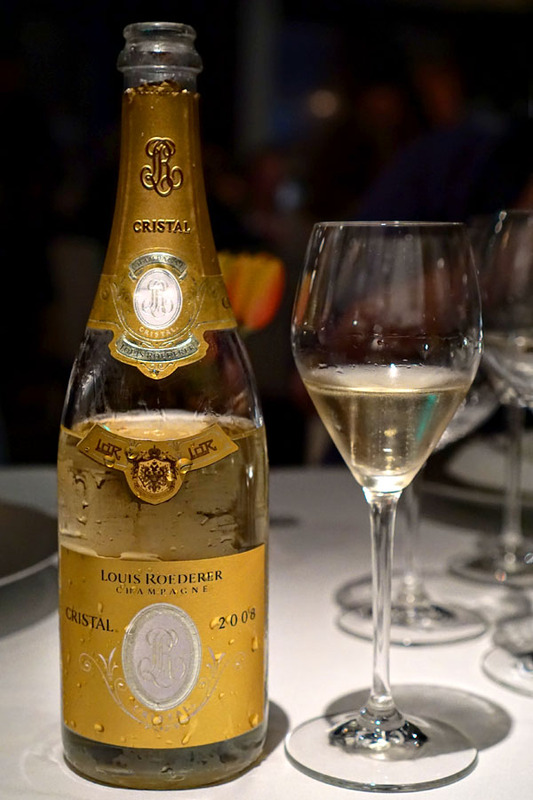 We had some Champagne to start, the Louis Roederer - "Cristal" - Reims, 2008. It smelled superb, giving up aromas of toast, chalk, lemon, and stone in perfect harmony. On the palate I got lots of brioche, along with pome fruit, some nuttiness, and a pleasant acidity, while the finish was all about elements of candied lemon with a tinge of minerality. This wine is drinking wonderfully now, and is more concentrated than most young Cristal I've tasted, but still has many great years ahead of it I'd wager. 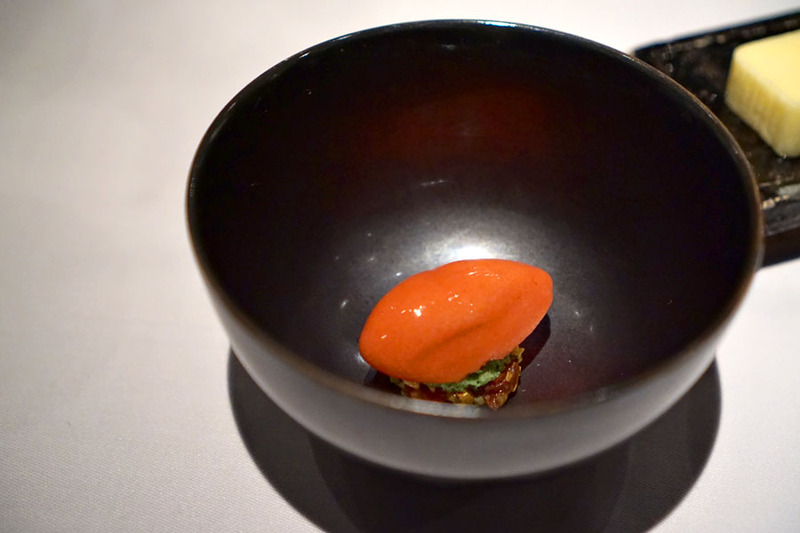 The second amuse was a bigeye tuna tartare wrapped in avocado, with sorrel panna cotta and a yuzu vinaigrette. 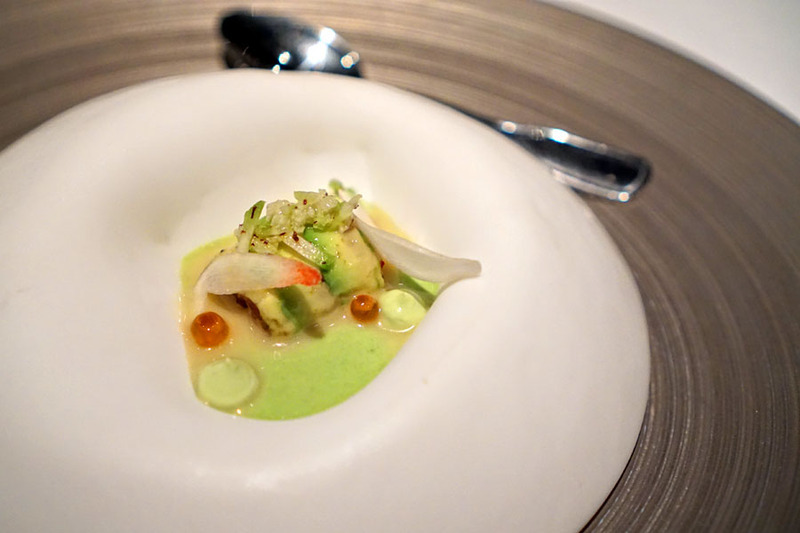 The course wasn't completely successful, as I felt that the fish was overpowered, first by the lushness of the avocado, then by the plethora of strong, onion-y notes present. 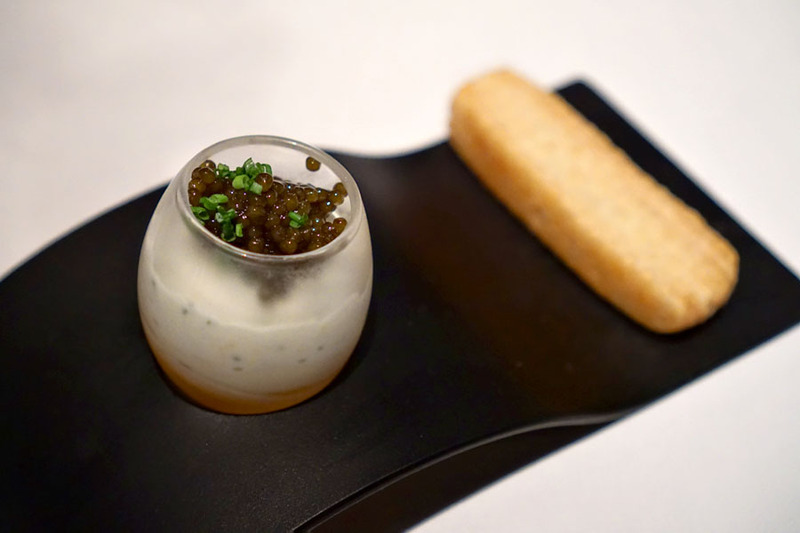 Mélisse's well-known egg caviar dish certainly delivered. 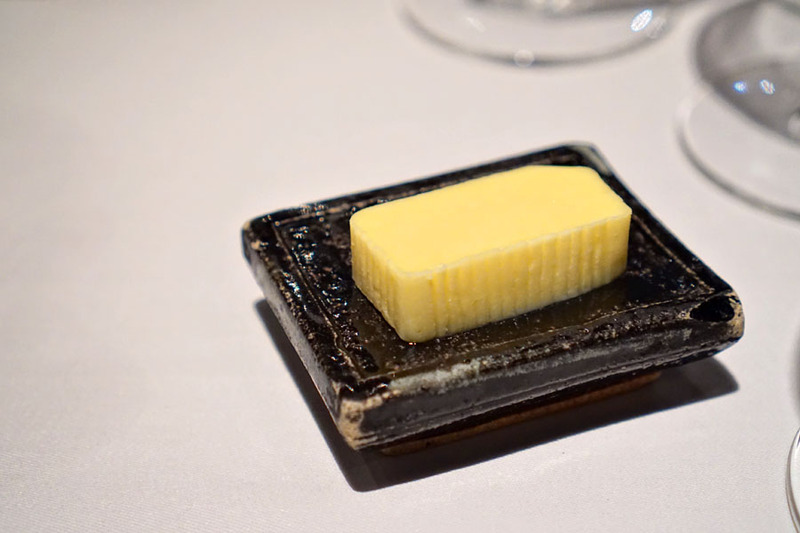 The key for me was the luxurious of that runny egg, and how it served as a stage for a back-and-forth between tart citrus, smoke, and salty caviar in particular, the cauliflower cream moderating everything. 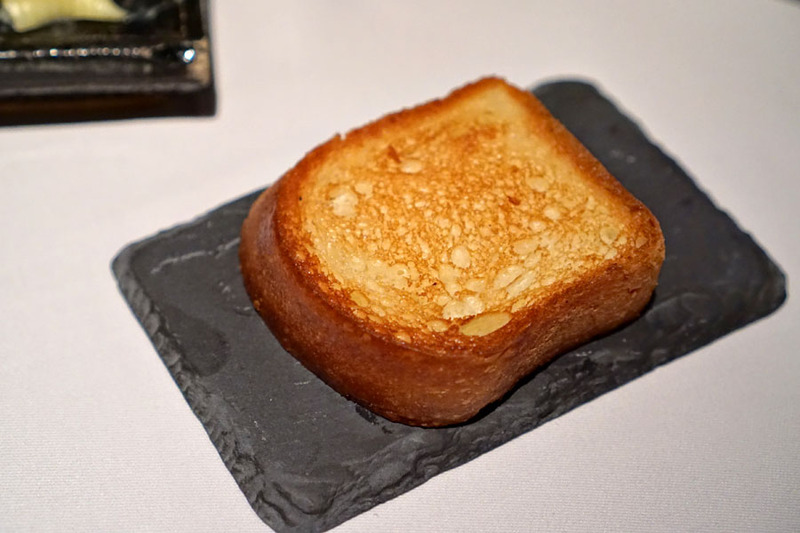 Loved that super flaky brioche on the side, too. 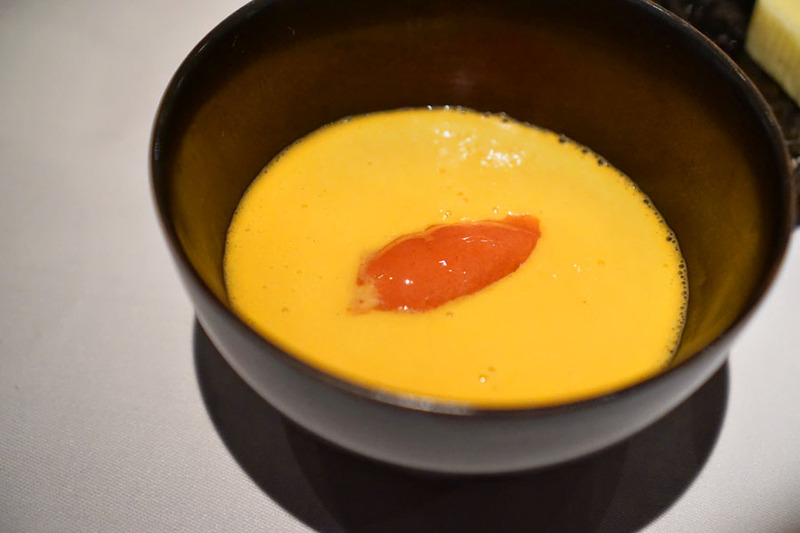 This was a study in contrasts, first in temperature, then in taste between the sweet-tartness of the strawberry and the cozy, savory, familiar nature of the soup. 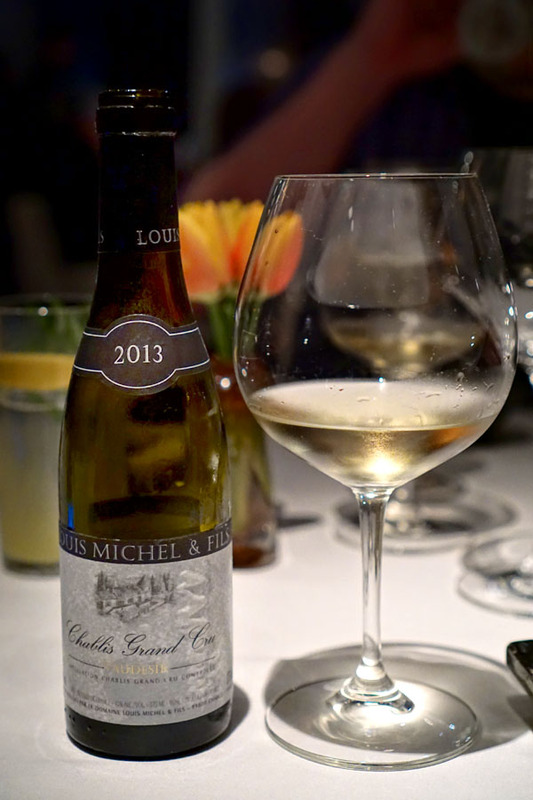 At this point we began a progression of half-bottles, and first was the Chablis Grand Cru "Vaudesir" - Domaine Louis Michel et Fils, 2013 [$85]. Nose of grass, apricot, lemon, stone, and oak. Taste-wise, I got fresh, fruity flavors up front, commingled with some minerals, a bit of barnyard, and a persistent acidity. The wine was a bit more robust than I was expecting, and actually got quite buttery as it warmed. 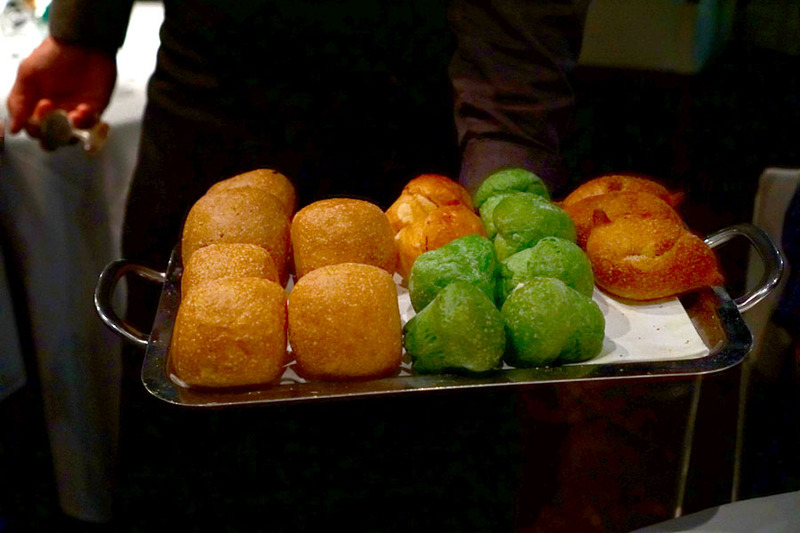 Five types of bread were offered this evening: a classic ciabatta, a subtly smoky olive ciabatta, an unmistakably herbaceous basil brioche (great with that salty butter), a soft 'n' sweet brioche, and a wheat French roll. 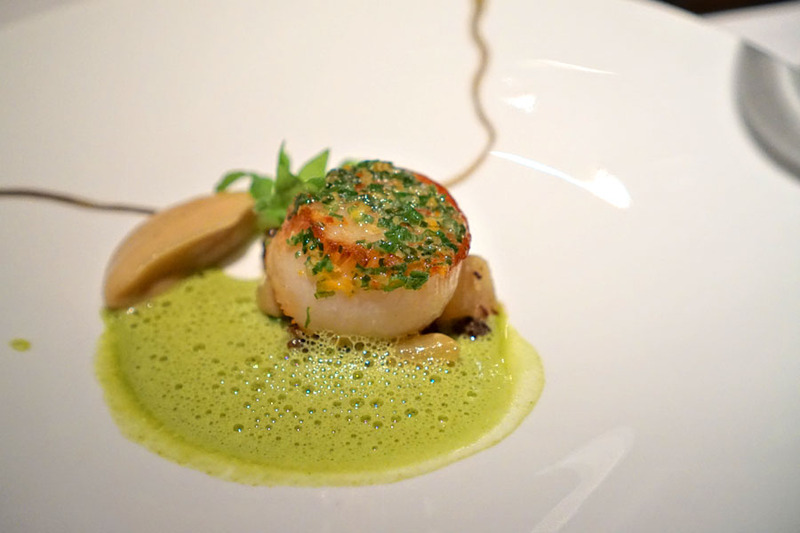 A lone scallop arrived perfectly cooked and caramelized, its brine well accented by the brightness of pea and zesty notes of green garlic, all while the morels provided an extra oomph to the dish. This was even better when taken with the wine above. The pasta course was a crowd pleaser. 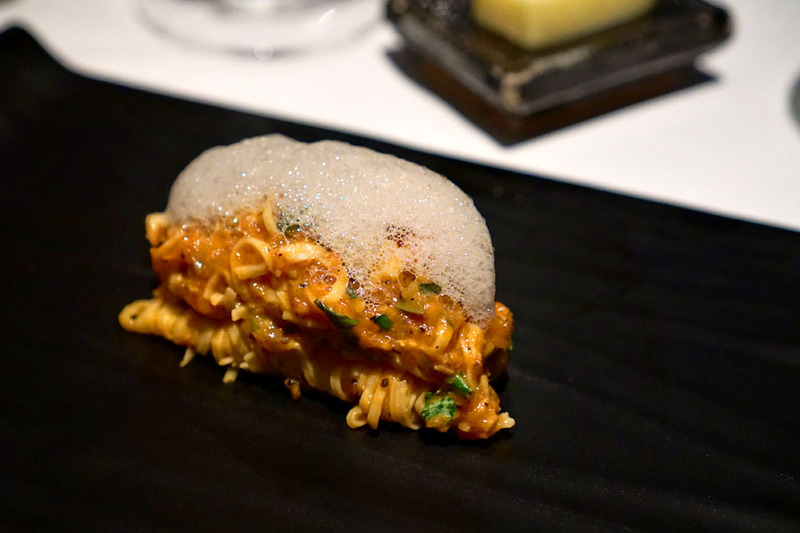 Texturally, the capellini was on the softer side, which I didn't mind in this application, and the pasta worked swimmingly as a vessel for the tart, herby bolognese, which was punctuated by meaty bits of lobster and the overarching earthiness of truffle. This was also great with the Chablis, and in fact tended to emphasize the wine's sweeter notes. 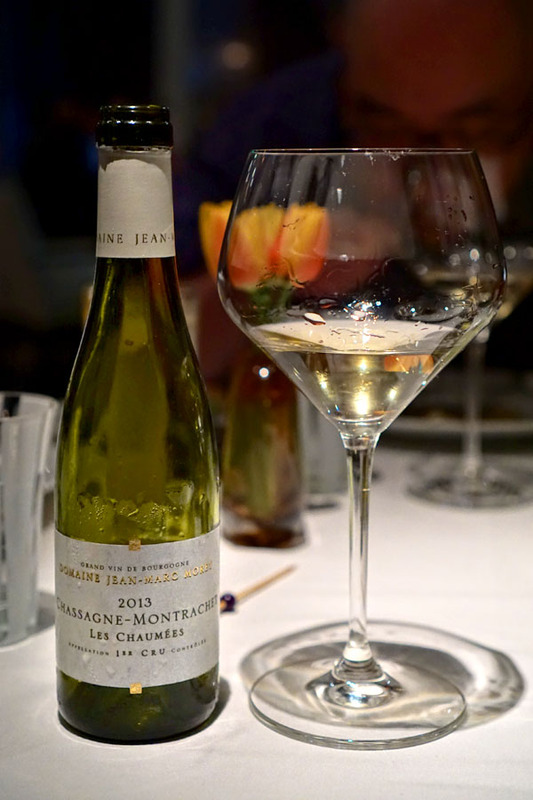 Our next wine was the Chassagne-Montrachet 1er Cru "Les Chaumees" - Domaine Jean-Marc Morey, 2013 [$90]. I found the nose here somewhat astringent at first sniff, but with a fruit backing and touches of minerality. On the palate we had some lovely spicy notes, more fruit, some vegetal elements, stone, and a distinct grassiness. 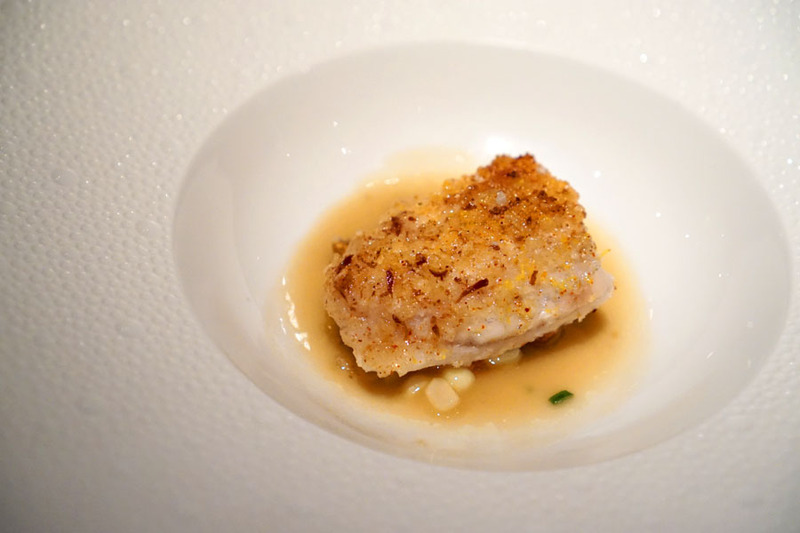 Sole came out beautifully textured, with a definite springiness to its flesh, while the taste went in a delicately sweet direction, amplified by the brown butter. I was afraid that the combo of corn and chanterelle might be too much, but it actually served as an appropriate foil to the fish. 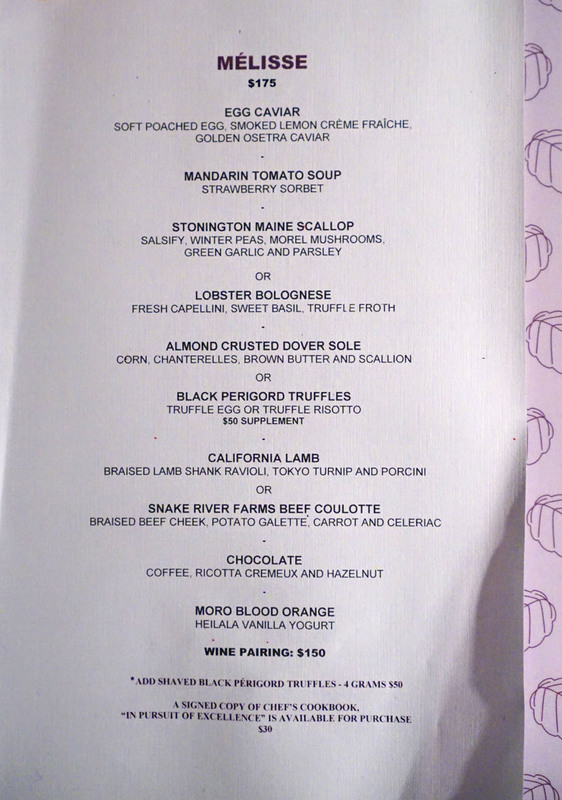 Next came a duo of truffle courses. 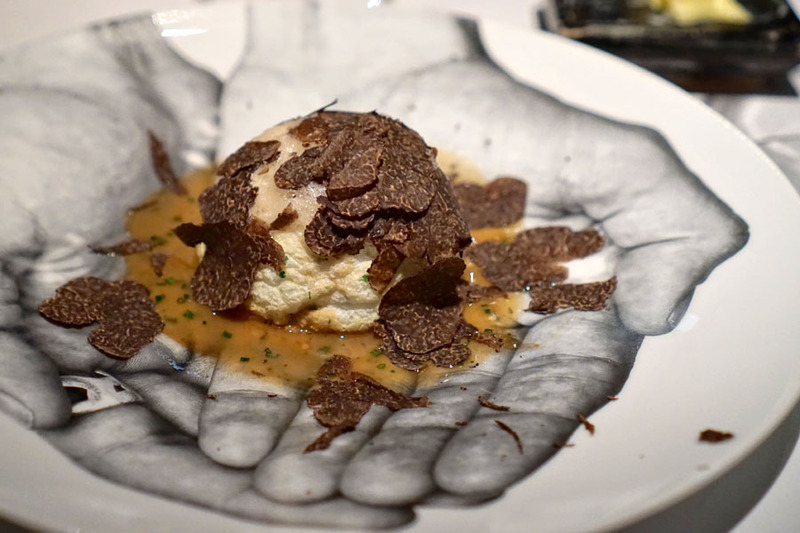 Our first was described by our server as a "soft-baked egg white cloud," with truffle sauce, brown butter-truffle froth, and shaved black Périgord truffle. As expected, the actual "cloud" was super light, almost airy, while flavors highlighted the timeless interplay between truffle and egg. 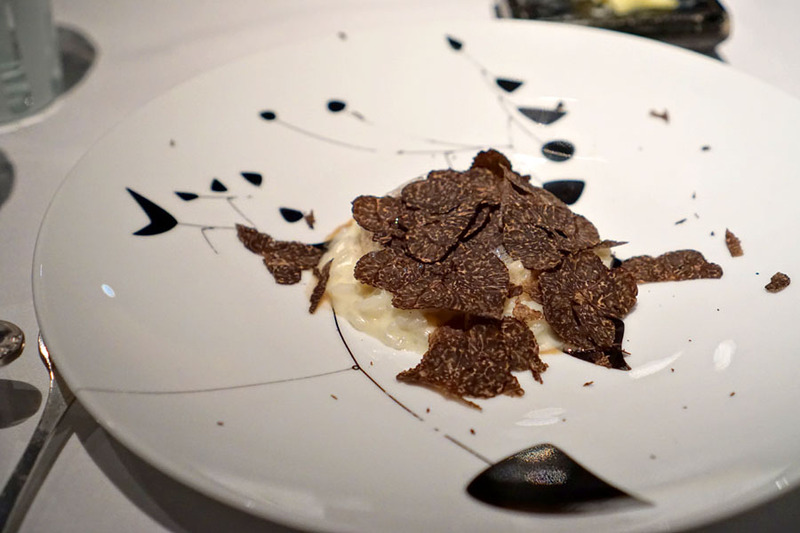 Here we had an aged Arborio rice risotto, with mascarpone, Parmigiano-Reggiano, and more of that brown butter-truffle froth. It's hard to go wrong with this set of ingredients, and indeed, the dish was just as gratifying as I'd imagined. I also appreciated the substantial, somewhat chewy consistency of the rice, which provided some textural interest. 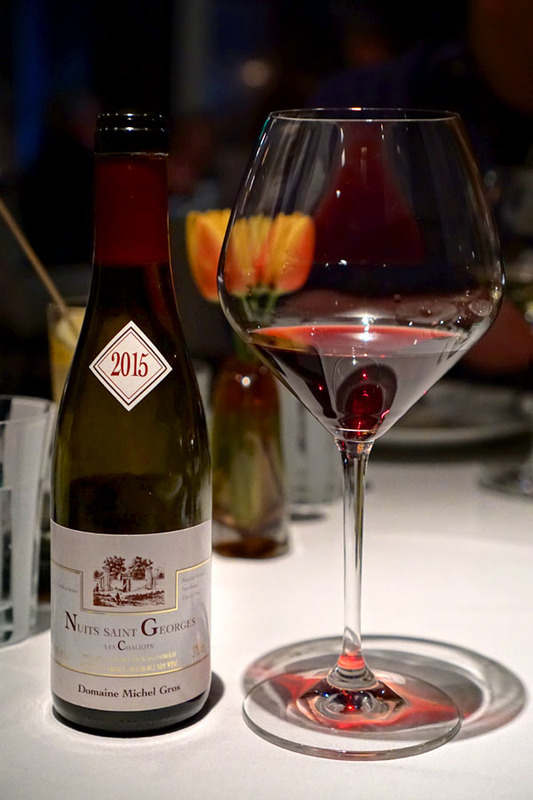 For our final wine, we again stayed in Burgundy and went for the Nuits-Saint-Georges "Les Chaliots" - Domaine Michel Gros, 2015 [$100]. With this, I detected aromas that were on the medicinal, herbal-spicy, somewhat rustic side, with just a smidgen of fruit. The palate, however, was quite another story, and displayed elements of smoke, spice, game, and roast meat, perked up by pervasive tannins. And now we get into the heartier courses. 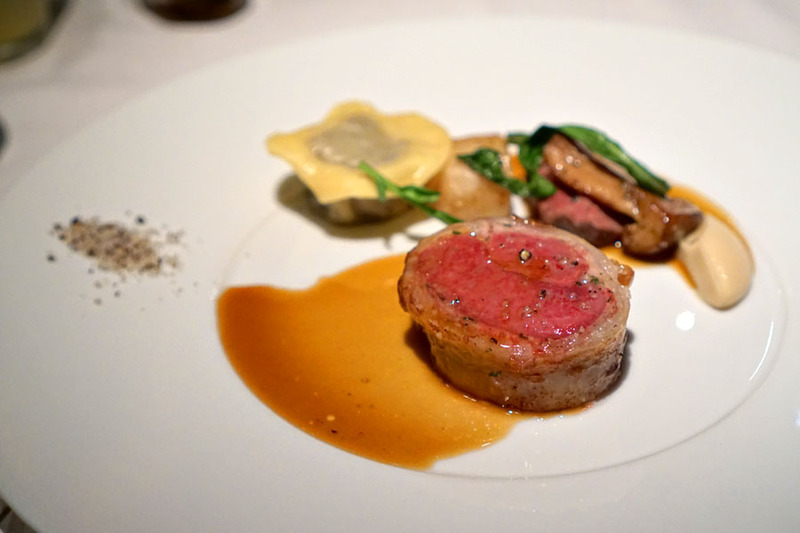 Lamb was a standout, and one of the better preparations of the meat I've had in recent times. I just found it super tender, super juicy, and super flavorful, with a wonderful herby character to boot. I got a nice bitterness from the turnips, too. 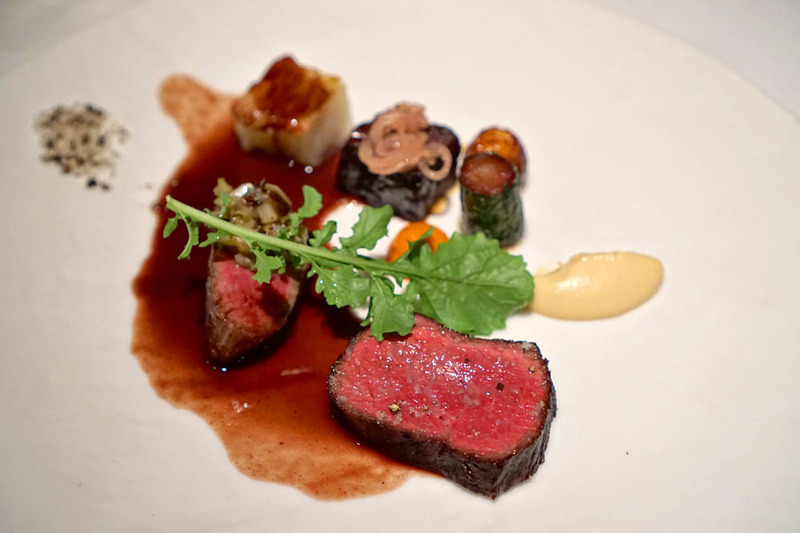 In our final savory course, supple cuts of top sirloin showed off an unexpected sweetness, which actually matched up well with the pepperiness of the beef. As for the cheek, it had your usual dark, savory flavors, while the somewhat crunchy potato worked as an effective counterpoint in the dish. I also liked what I believe was horseradish here. 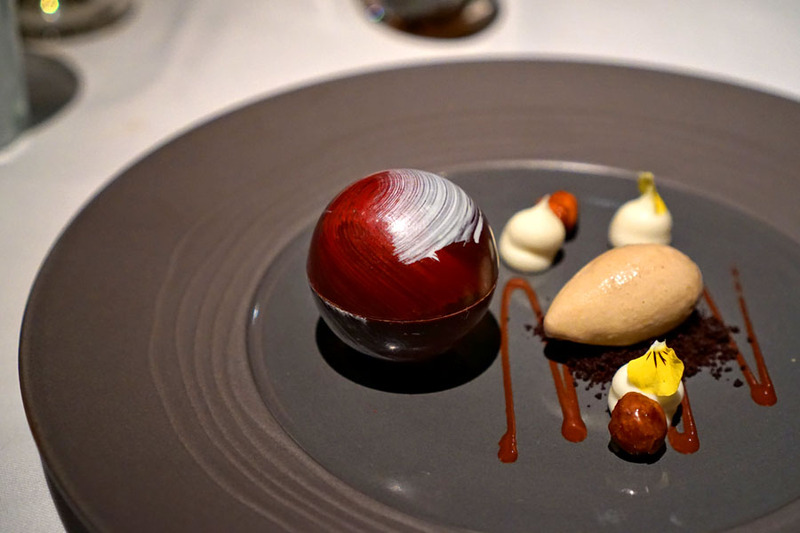 Our first dessert featured a moist chocolate cake contained in a spherical shell, which meshed in classic fashion with flavors of hazelnut, caramel, and coffee, all while the ricotta worked to lighten the dish. 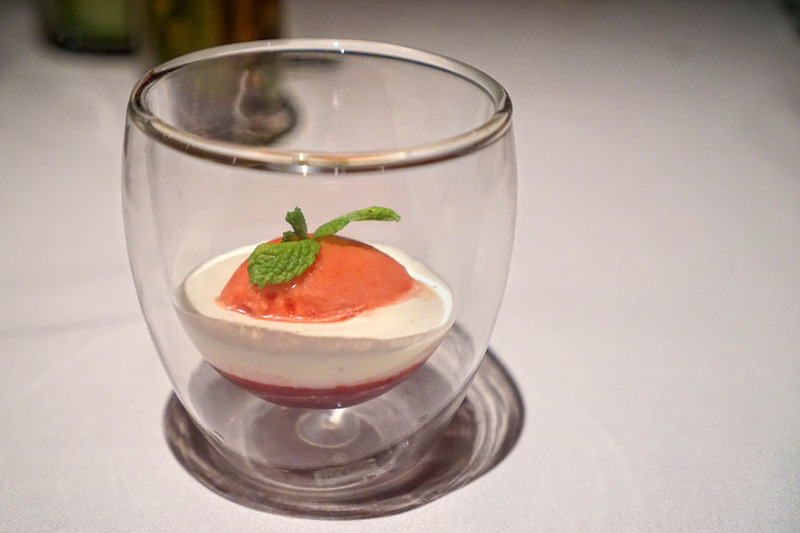 The chocolate was followed up by a much lighter dessert, this one featuring familiar Creamsicle-like flavors, but with added tartness. 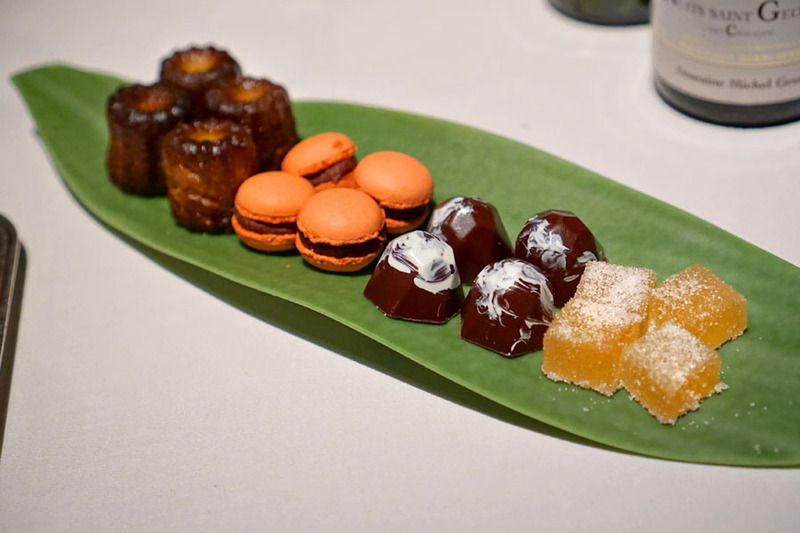 Finally, we have the evening's mignardises selection: thickly caramelized canelés, fruity macarons, salty-sweet bonbons, and tangy pâtes de fruits. I was glad to make it out for one final meal at Mélisse. The food was by and large quite good, though admittedly, it's not the type of cooking that's exactly on trend these days. As for what the future holds, the staff informed us that the goal is to re-open in the fall with a completely new concept, though apparently the name will remain. While the updated Mélisse will certainly be a more casual affair, from what we were told, the team is also planning a more intimate, "chef's counter" sort of dining experience. So overall, there's a lot to look out for in the coming months. Starving children in Africa are celebrating Mélisse closing for good. So many anonymous cowards. Is this still cause of the Golden Road review? "So many anonymous cowards." Says the anonymous poster. I am about to go to sleep and tonight I will dream about potstickers because that's what I'm having for breakfast in the morning. My dipping sauce consists of soy sauce, vinegar and chopped up chili peppers. Can't forget about the raw cloves of garlic which goes well with jaozi or potstickers. Who wins in a fight between Chengdu Taste and Xi'an Famous Foods? My babe, my everything, can we get some seafood reviews?